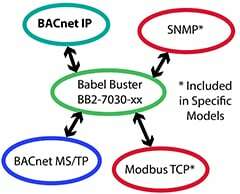 The Babel Buster BB2-7030 BACnet Router routes BACnet messages between BACnet IP and BACnet MS/TP networks. The BB2-7030 BACnet Router can be a learning router or configured router, and includes BBMD support. The BB2-7030 BACnet Router also provides slave proxy capability to answer to Who-Is messages on behalf of devices that do not support dynamic binding. The Babel Buster BB2-7030 provides internetworking for connecting multiple BACnet IP networks across a wide area via standard IP or NAT routers. 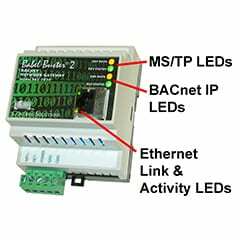 The BB2-7030 BACnet Router can be used to connect MS/TP networks to BACnet IP, or connect multiple BACnet IP networks to each other, or both at the same time. 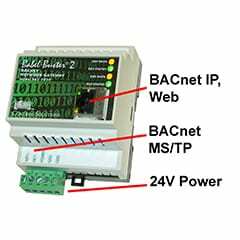 Babel Buster BB2-7030 BACnet Router can also operate as a BACnet gateway, reading and writing other BACnet devices and retaining a copy of object values in its own set of BACnet objects. The BB2-7030 also provides a Modbus TCP client and server, or SNMP client and server, for additional gateway flexibility. 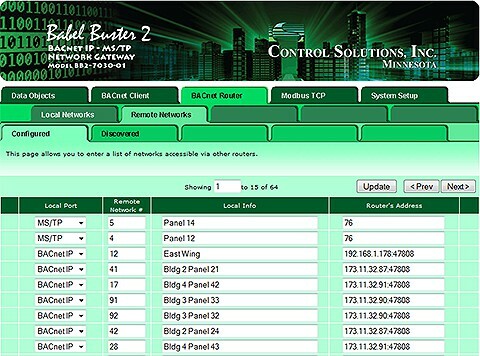 Control Solutions’ Babel Buster BB2-7030 is a BACnet router, slave proxy, and client/server gateway that allows remapping objects from multiple slaves into one master. You can use the BB2-7030 as just a router, just a slave proxy, just a client/server, or all three at the same time. The BB2-7030 also includes BBMD support. The BB2-7030 as a BACnet Router will route IP to MS/TP and vice versa via its local ports, and supports full router capability for multi-hop internetworks including via NAT WAN routers. The BB2-7030 as a BACnet Slave Proxy will provide I-Am responses on behalf of devices that do not have I-Am support, or are slave-only devices. The slave proxy capability will allow systems to utilize dynamic address binding with devices that do not support dynamic binding. 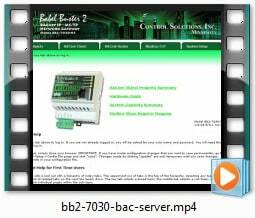 The BB2-7030 as a BACnet Client/Server Gateway will poll BACnet IP and/or BACnet MS/TP slaves or servers, and retain copies of selected object Present Value properties. Upstream masters may then query the BB2-7030 to receive Present Value data originating from multiple devices. When used as a gateway, the BB2-7030's routing can be disabled to avoid conflict with other routers on the network. The base model BB2-7030-01 includes a Modbus TCP client/server that provides optional BACnet to Modbus gateway capability. Value objects will poll their assigned Modbus register at the interval you specify. The content of the Modbus register will be given as the Present Value of the BACnet object when read. The Modbus register is written each time the BACnet Value object is written. The Value object corresponds well with the Modbus Holding register. As a Modbus gateway, Input objects will poll their assigned Modbus register at the interval you specify, and provide the Modbus data as the Present Value when read. Commandable Output objects are used to write Modbus registers, and will update the Modbus device each time BACnet is updated. Models BB2-3060 and BB2-7030 can both be used as an MS/TP to Modbus TCP gateway. Which one should you use? If you are familiar with the BB2-3010 Modbus RTU to BACnet MS/TP gateway, and would like to use a Modbus TCP version of the same gateway using the same configuration tool, then the BB2-3060 is the better choice. Some will find the Windows based configuration tool for the BB2-3060 to be more convenient than the web based configuration of the BB2-7030. If you are already familiar with the BB2-7010 or BB2-7030, then the BB2-7030 will have a familiar look and feel. However, because the BB2-7030 is also a BACnet router, it will potentially cause problems if you do not disable routing when there are other routers on the network and you only want to use the BB2-7030 as a gateway. If you prefer web based configuration, then the BB2-7030 is a good choice for you. The BB2-7030-02 provides an SNMP client and server instead of Modbus TCP. The combination of SNMP agent (server) and BACnet client makes BACnet devices accessible from SNMP. The SNMP client allows SNMP devices to be accessible from BACnet. You configure the remote SNMP agent's IP address, the OID of the MIB variable you wish to poll, and set a polling interval. 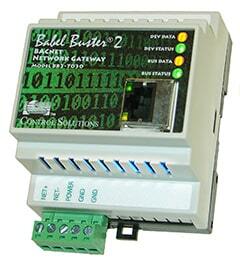 The object data is stored in the BB2-7030 server for subsequent retrieval by another BACnet client. The BB2-7030 includes its own internal web server that provides a web based user interface for configuring the BB2-7030. Configuration is done using simple templates, and each web page has an online help section at the bottom. Click on any of the links below to view a demo copy of the entire Web UI in the BB2-7030. The object pool may be allocated among the following object types, with a minimum of 1 per object type: Analog Input, Analog Output, Analog Value, Binary Input, Binary Output, Binary Value, Multi-state Input, Multi-state Output, Multi-state Value. • Maximum 1024 states for Multi-state objects with state text, actual number of objects/states supported varies by resource usage per object. Useful object counts may be further limited by configuration file size which varies with use of character strings for object names, descriptions, and state text. MIB walk is limited to approximately 300 to 400 objects. 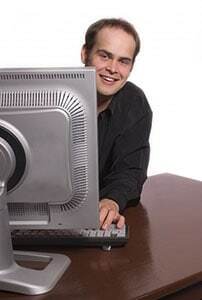 You would normally use the web pages found in the gateway itself to configure the gateway. But you may be able to take a shortcut if you have a long list of registers already in CSV file format. The Babel Buster Configuration Builder is used to facilitate building of configuration files (aka "profiles") for Babel Buster network gateways by converting XML files to CSV files and vice versa. This simplifies the process of creating or changing a large number of entries because you can use any standard spread sheet program to manipulate the content of one or more CSV files, and then convert that into an XML configuration file that can be loaded into the gateway. If the gateway will be reading a long list of Modbus registers, for example, you can sometimes just copy a list of registers from another source, paste into a simple text file, and import that into the spread sheet program. Then add a header line to label the content, add a handful of additional columns, and you quickly have most of a complete configuration. Very often, the only thing that changes from one line to the next is the register number. The other entries can be quickly made by entering once and using the spread sheet program's "fill down". The Babel Buster Configuration Builder simplifies the process of making global changes to a large number of gateway register or object "maps". The gateway “converts” protocols by querying devices on one network with one protocol, and then saving that data internally so that it may be accessed on another network using a different protocol. The designation of what should be queried is referred to as a “map” in the gateway. In most applications, most or all maps are “read” maps, meaning the gateway will read data from some other device. A “write” map will write data to that device. Most often the gateway will actively read data from a device and passively wait for another device on the alternate network to query the gateway to obtain that data. But it is also possible to configure the gateway with two sets of maps, one to actively read device A using protocol A, and then actively write that data to device B using protocol B. The process can also be reversed, and can be done concurrently. You may both read and write data on one network while writing and reading data on the other network. The point of this configuration builder is to simplify the process of entering long lists of registers or objects. Where most of the parameters are the same for many maps, using a spread sheet program's "fill down" makes the process fast and easy. There are situations where creating a CSV file for configuring some aspect of the gateway is actually going to create more work than simply using the web UI or PC based software to directly configure that aspect. Configuring the Modbus RTU port baud rate is one such example. There is only one setting. A CSV file would create more work rather than less, as intended. 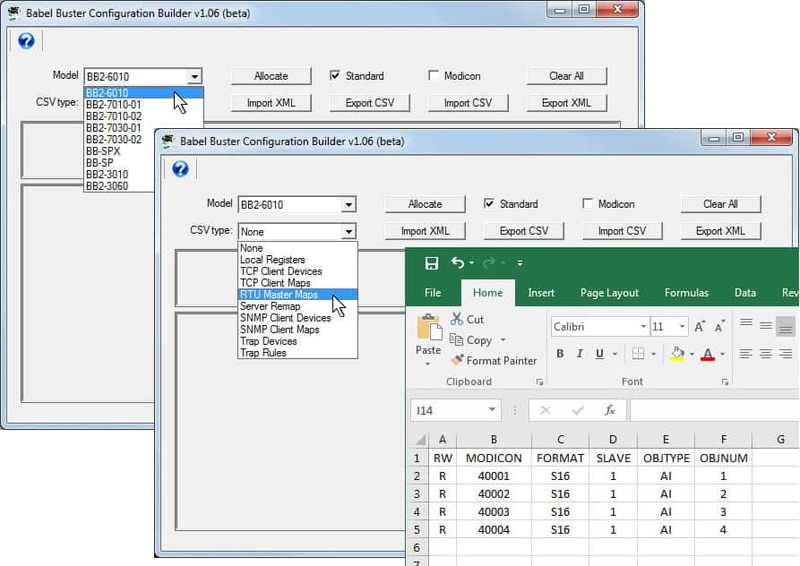 Therefore, the configuration builder only supports CSV import/export for those aspects of gateway configuration that involve long lists of largely replicated parameters. There are a very limited number of list type entries that are not supported in part because they are seldom used, and in part because very little of the list is replicated from one entry to the next. The BACnet Broadcast Distribution Table is one such example. Do note, however, that if you have already done a lot of configuration, have saved that to an XML file, and want to add a list from a CSV file, you can do that. Refer to the section in the user guide that talks about modifying an existing configuration. This tool is free and available for download now. Unzip and run the bb-builder-setup.exe file. Open the program, and click the help icon (blue question mark in upper left corner) to access the user guide. The very first section tells you how to get started. Download the Babel Buster Configuration Builder here. Need even more help with your network gateway configuration task? We can do the configuration for you, or at least give you a big head start. We are working on building a library of configuration files for commonly used devices. If yours isn't already in the library, we will add it. To get started, open a support ticket and attach a copy (typically a .pdf document) of whatever documentation you have for your device. In addition, provide a list of the registers or objects you want to read or write. Of course, you can also start by asking if we already have that device in our library. If you have a proprietary application that you do not want included in our library, you can hire us at a very reasonable rate to do custom, proprietary configuration work for you, too.